We were very fortunate to have been given two tools for cultivating the soil and hoeing by our good friend David. In this video, Andrew talks about how to clean and care for your tools, and we show them both in action. The soil miller is a Wolf Garten product. With its star shaped wheels, it looks fabulously medieval! They are designed to break down the soil as you work it back and forth, and a rear blade that cuts through any weeds. Not only that, but the soil miller comes from the Wolf Garten multi-change tool range, which comprises a selection of handles and tool heads. Having got a handle we could potentially explore other tool heads in the range. Also known as the stirrup hoe, the swivel hoe or the reciprocating hoe. The stirrup shaped head has a swinging motion that keeps it at the right angle. 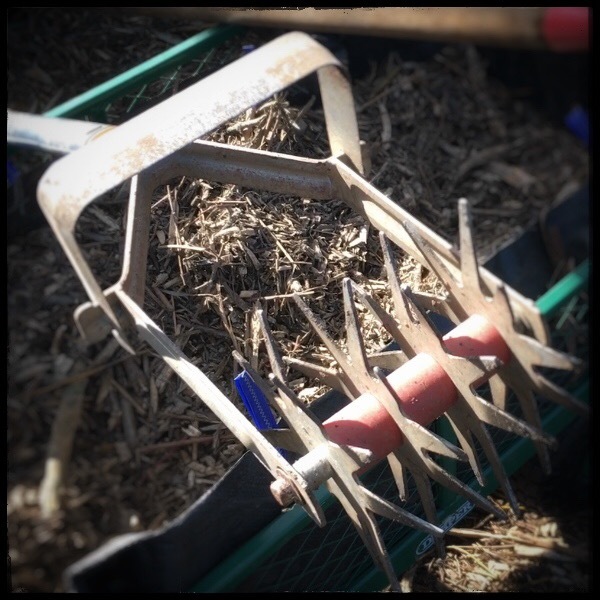 It should have a sharp edge that cuts through weeds as you move it back and forth through the top layer of soil. It should be self sharpening. We cleaned ours up and Andrew gave the edge a bit of a sharpen. Hopefully, that’s all we need to do to keep it in good working order. Here we go. Second week of April. 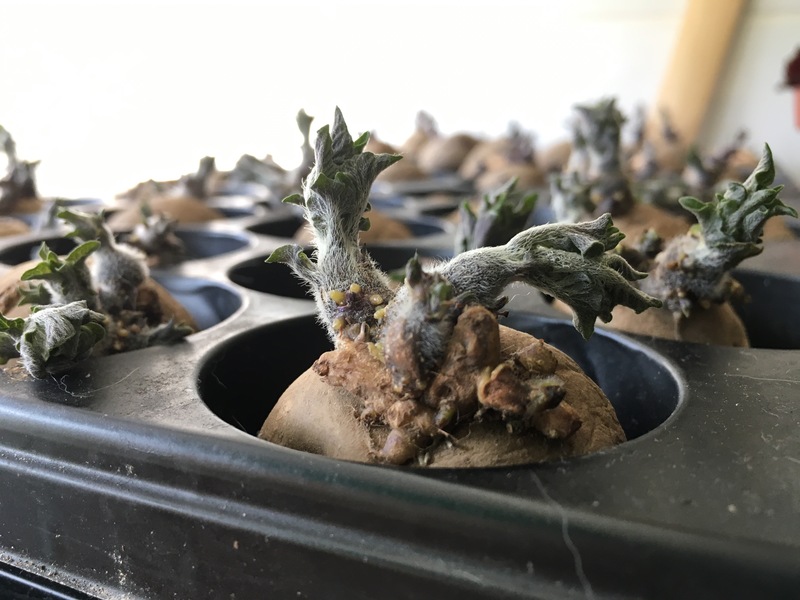 Chitted potatoes ready to be planted. Lots of seeds that can be sown directly into the soil. Bring it on. We started the day full of hope and ambition. What can I say? It was a lot harder than anticipated. Part of the problem was, of course, the weeds. We uncovered the planting area only to see a host fresh weed shoots. 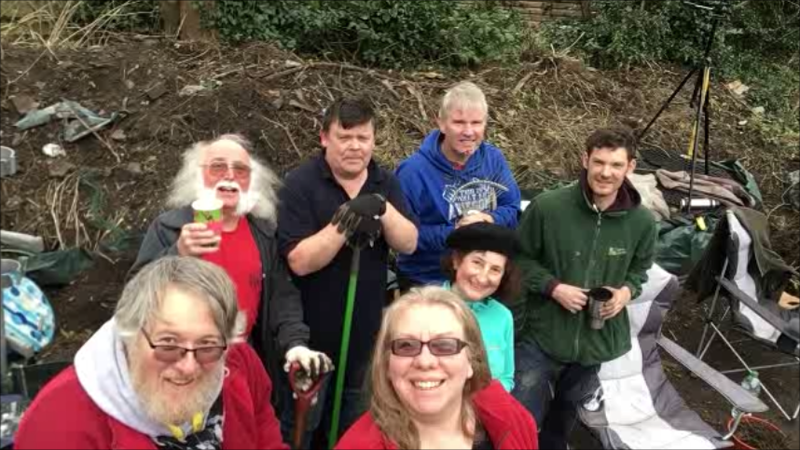 They all had to be dug out carefully because even the smallest amount of root can grow a new plant (or two!). 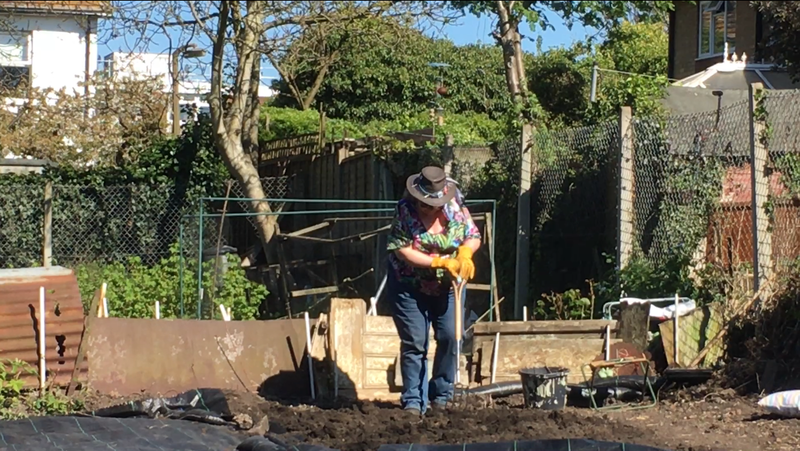 So, by the time it came to digging trenches to plant the potatoes I was pretty much exhausted. Nevertheless, trenches were dug and potatoes planted. You can see how we got on in this video. 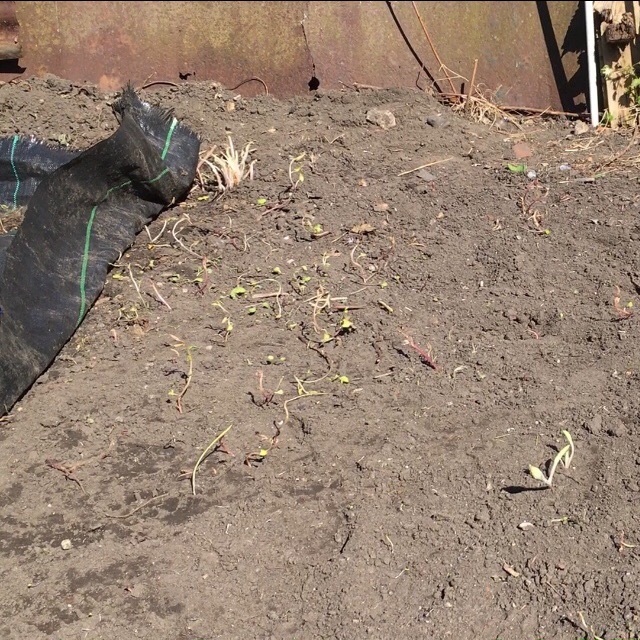 We’re also trying out planting potatoes in bags that Andrew is making. He is using the plastic fabric from some spare one ton builder’s bags. He cuts it to size and sews two seams up the side and attaches a base panel. Here is the prototype. It will be interesting to compare the crop yield with those in the ground. He is also using the fabric to create other things such as this hanging bag. You’ll notice that we didn’t plant any seeds. I’m afraid we exhausted ourselves dealing with the potatoes. The seeds will have to wait for another day! Dandelion – friend or foe? Say dandelion to most gardeners and they’ll say weed right back to you. Think of a commercial weed control chemical and the chances are it will have the picture of a dandelion on it. But is this reputation deserved? Is it time to think about growing dandelions as a crop? Dandelions have a long history. They have been recorded in cultivation for at least 1100 years. Their Latin name is Taraxacum officinale, with Taraxacum thought to originate from their medieval Persian name tarashaquq. The officianale bit of the name indicates the plant has been regarded as an official herb either culinary or medicinal. Indeed they are said to contribute, among other things, to liver health, strong bones, skin health, gall bladder function, reduced acne, weight loss, lowering diabetes, maintaining blood pressure, having a diuretic action, and treating jaundice, anaemia, constipation! It is even purported that they have anti-cancer properties. While we’re talking about names, dandelion comes from their French name dent-de-lion or lion’s teeth, a name inspired by their long irregular leaves with jagged tooth-shaped edges. Dandelions are said to have both medicinal and culinary uses. Their roots, leaves and flowers can all be eaten. But it is worth noting that their milky sap may be a skin irritant and in severe cases could possibly cause contact dermatitis after handling. 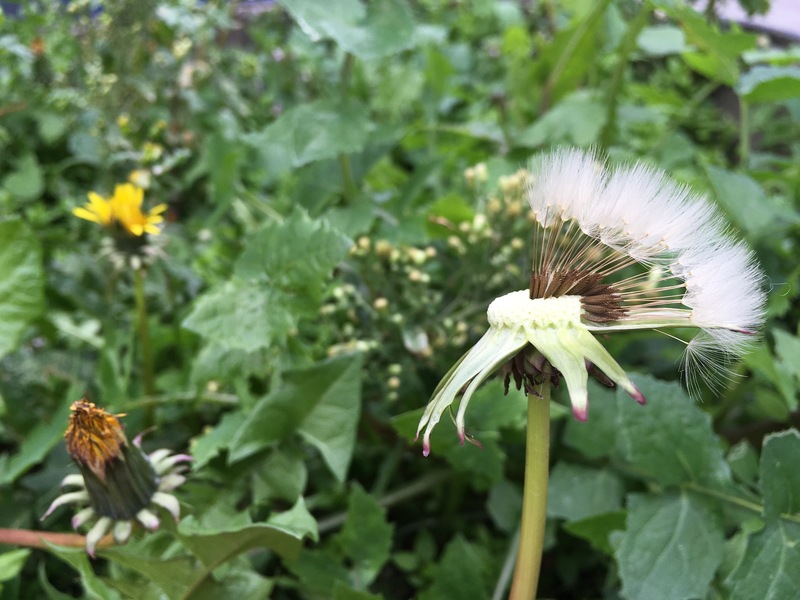 Dandelion pollen has been known, on rare occasions, to cause allergic reactions when eaten, or adverse skin reactions in sensitive individuals. This only highlights that you need to take care when dealing with plant material. Wear gloves and try a little before diving right in and munching away, are sensible precautions. Dandelion roots can be roasted and ground, and used to make a caffeine-free dandelion coffee. This is well worth the effort, as it tastes very good. Andrew has made it while out camping. Simply collect some roots, give them a good wash and roast them in a tin can until they are brown and crumbly (but not black as this will spoil the taste). Break the roasted roots into small chips (about the size of instant coffee granules) and pour boiling water over them. Let this brew for a little while and strain. Enjoy as it is, or add milk and sugar to taste. Not planning on going camping? You can make this coffee in your kitchen at home as described in this Rangers blog article. Dandelion was also traditionally used to make the traditional British soft drink dandelion and burdock, and is one of the ingredients of root beer. You can still buy these beverages in the UK but it can be hard to find versions that are true to the traditional recipe. One place where you can is a temperance bar in Rawtenstall, Lancashire. You can enjoy a number of root based drinks at Fitzpatrick’s Temperance Bar & Emporium is said to be Britain’s last original temperance bar. Their botanically brewed vintage-recipe beverages can purchased on line. Not following the temperance root? The flower petals, along with other ingredients, usually including citrus, are used to make dandelion wine. Dandelion leaves are packed full of vitamins (A,C and K) and minerals (calcium, potassium, iron and manganese). Their leaves are delicacies eaten mostly in salads and sandwiches. 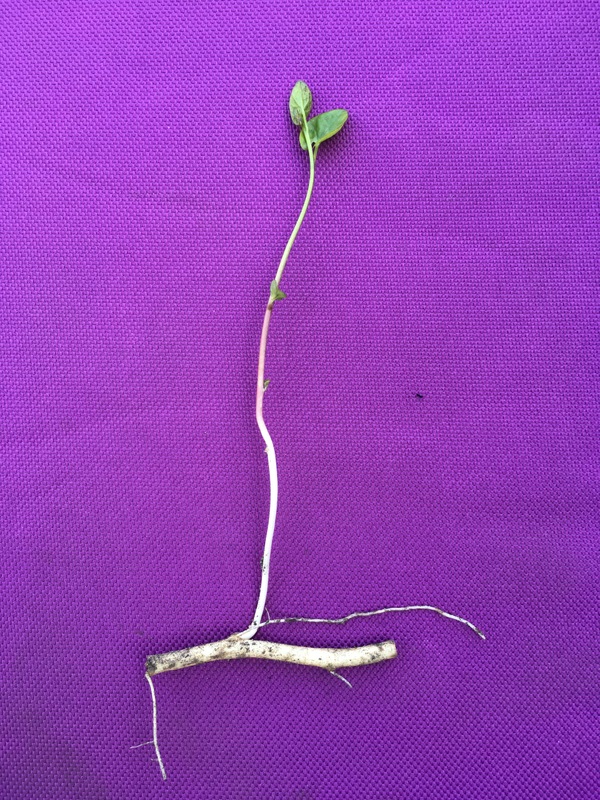 If you leave their taproot intact, you can harvest the leaves and they will grow more. 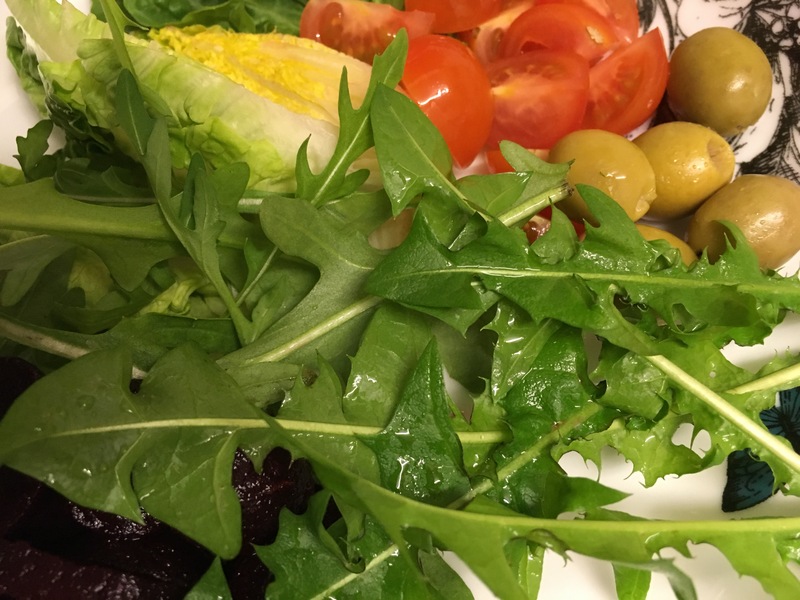 Alternatively, try dressing your carefully washed dandelion leaves with a simple vinaigrette, before stirring through some pan fried shallots and smoked lardons, and finishing with quartered boiled eggs. The leaves have a slightly bitter taste. If this is not to your liking, you could try a little horticultural blanching to make them more palatable. This is blanching their leaves by excluding light. You can do this for as little as two days, although if you wish to completely blanch them and achieve a harvest of white leaves, then cover for a longer period. Worth a try to see how this affects the taste. Another method of removing some of the bitterness, is blanching with hot water in the kitchen. Just bring a large pot of salted water to a boil. Toss in the dandelion greens; blanch for 1-2 minutes. Remove and plunge into an ice bath. Remove from the ice bath and squeeze as much water from the leaves as you can; use as you would any cooked green. We were also intrigued by this recipe for Dandelion Pumpkin Seed Pesto from Megan Gordon on Kitchn. We have converted the recipe amounts for the UK, but you can find the US measurements on the Kitchn site. Preheat the oven to 170°c. Pour the pumpkin seeds onto a shallow-rimmed baking sheet and roast until just fragrant, about 5 minutes. Remove from the oven and allow to cool. Put the garlic and pumpkin seeds together in a food processor until very finely chopped, continue adding parmesan cheese, dandelion greens, and lemon juice and process continuously until combined. Stop the processor every now and again to scrape down the sides of the bowl. The pesto will be very thick after awhile then slowly pour in the olive oil and process until the pesto is smooth. Add salt and pepper to taste. Like any wild plant, there are a few rules you need to stick to when collecting. only remove enough to allow the plant to continue to grow/seed. Most dandelions in the UK are likely to be the bog standard Taraxacum officinale that pop up everywhere. If you are able, place a bucket on top of the plant(s) a couple of days before collecting to helps to reduce the bitterness of the leaves and collect the younger leaves from the centre of the rosette. Dandelions are herbaceous perennial plants with a height and spread of up to 40 x 40 cm. There are about 60 species and they bear white, yellow to orange flowers during spring and autumn. You can see some of the different flower types on this Wikipedia page. Some varieties are grown commercially, mostly in southern Europe, especially France and Italy. There are around three cultivated varieties that can be sourced from the links below. 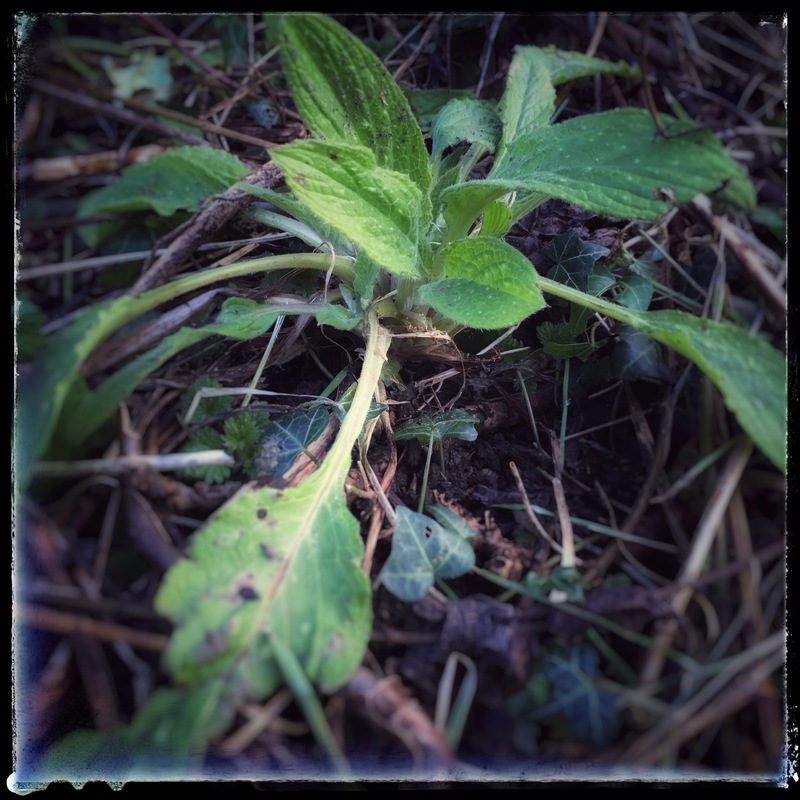 Taraxacum officinale – the bog standard dandelion. Available from Emorsgate seeds and Wildflowers UK. Thick-leaved dandelion, available from Chiltern Seeds. It is easy, vigorous and quick growing with large, thick, dark green leaves. It can be eaten or drunk as described above. For salads, a little horticultural blanching might be in order to make them more succulent plant by blanching the hearts either earthing up or tying the leaves together. Taraxacum pseudoroseum available from Chiltern seeds. A dandelion with a difference! With this you can expect the usual rosette of green leaves, but unexpectedly it bears rather appealing, bicolored, fluffy flowers of pink with yellow centres. Taraxacum rubrifolium available from Chiltern seeds. An unusual dwarf relative of the humble dandelion, it forms a small flat rosette of the deepest purple and has contrasting yellow dandelion flowers on short stems. It is also possible to find other varieties from online sellers based in other countries. And when you are on holiday, you are allowed to bring five packets of retail seeds into the UK for your own use. For more details on importing plants and plant material check out this site. Of course, some readers might have a problem with the import of foreign species of ‘weeds’ that might out-compete our own native plants. A huge number of garden plants were imported from abroad and some of those such as Rhododendron ponticum, have gone on to become invasive weeds. 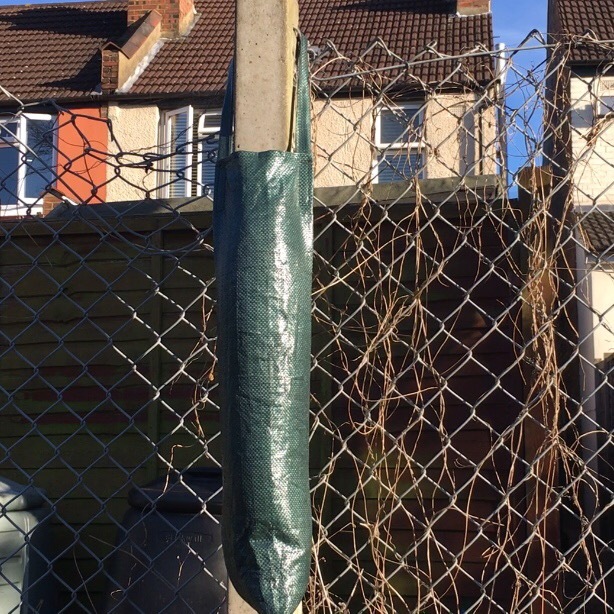 As with anything you have on your land – plants or animals – you must not allow it to escape and cause harm. Pissenlit à Cœur Plein amélioré yields an abundant crop without taking up much ground, and tends to blanch itself naturally, due to its clumping growth habit. Pissenlit vert de Montmagny is a large-leaved, vigorous grower, which matures early. Taraxacum albidum – very similar to the humble dandelion save for the creamy while flowers. If you do want to get rid of your dandelions, there are two options – chemical control and cultural control. lawn weed killers and Glyphosate based products. For information on weedkillers, check out the advice leaflet from the RHS. There are a number of specialist tools available for the job, including the one demonstrated in this video by ChrisFX. So here’s Andrew with the first tool we’ve bought for our new Quest for Veg allotment plot – the hand cultivator. It took us all day to buy it. 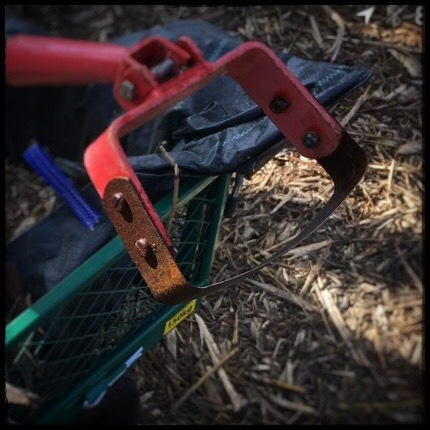 We started in a local hardware store where they had a decent selection of tools – including the cultivator we actually ended up buying. But it wasn’t quite what Andrew wanted. He was hoping for one with longer prongs and ideally five rather than three. So we went to another local hardware store where they had no cultivators at all and didn’t know what we were talking about. They did, however, have something we hadn’t seen before. It was fork with a sharp metal edge joining up the ends of its tines. It looked like a fork with braces on its teeth. Apparently it’s a spork – a cross between a spade and a fork. We were tempted but decided to continue our quest for the cultivator. We then tried a garden centre. It appeared to have lots of tools but, on closer inspection, the display was made up of about four sections, each for a different supplier showing the same limited range of tools with one or two variations. They had one long handled cultivator. But Andrew thought the prongs were at the wrong angle and it was over three times the price of the one at first one we’d seen. We then spent a very long couple of hours in B&Q. We didn’t find any cultivators but may have identified the shed we want. And finally Homebase where they only had a short handled cultivator. So, it was back to the first shop we visited! At least we had the satisfaction of supporting a local independent business. 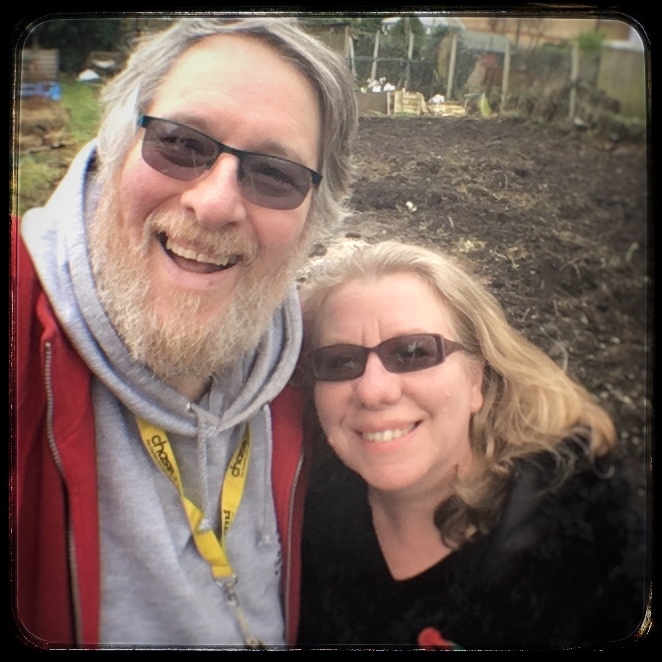 And then there was just time to end the day with an hour or so at the allotment where Andrew explained how to use the cultivator and set me to work.